Acrylic primer: A white paint used to prepare the surface before starting to Decopatch or Decoupage. A white surface shows off the decopatch paper colours to their best advantage. AquaPro: Special high gloss, satin or matt varnish. Aquapro varnish gives a more resilient water resistant finish. Blanks: Paper mache (papier mache if you're feeling posh) or MDF animals, shapes, boxes, photo frames,words, letters etc designed to be decopatched. Brayers: Mini rollers, originally designed for print work. Useful tools for smoothing and removing air bubbles from under larger areas of paper. Deco Mache: A brand of decoupage / decopatch products. Sometimes used as another term for decopatching. 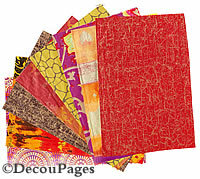 Decopatch paper: Specially designed paper that is thin and flexible but is also strong when wet. The colours don't fade or bleed. It comes in a huge range of colours and designs - you'll feel like a kid in a sweet shop! Decoupage: The technique of decorating objects with cut up pieces of paper glued to the surface. Often many layers of varnish would then be built up to give a smooth finish. Gesso primer: (Pronounced with a soft g like George.) The white primer used to prepare surfaces for decopatching or decoupage. Usually white acrylic water based primer is used rather than traditional gesso which is made from animal skin glue and is rather smelly. Glitter glue: Glue-varnish that contains glitter to give a sparkly finish. Glossy-Glue: Also called glue-varnish, the glue glue used for decopatch gives a glossy fininish, so there is no need to varnish unless you need a more resilient or water resistant finish. Glue-Varnish: 2-in-1 glue that gives a satin sheen to the finished article. Suitable for a wide range of surfaces including card, papier mache, wood, metal, glass and ceramic. Hog's Hair Brush: The type of paint brush generally recommended for Decopatch. Hog's hair is naturally quite stiff so it can help press the Decopatch paper down without the bristles bending too much. Mod Podge: A brand of Polyvinyl Acetate all-in-one glue, sealer and finish. Water based and very versatile, but it does smell a bit. Available in matt and gloss finishes. There is a whole range of Mod Poge brand decoupage products. Sometimes the term is used to mean decoupage, as in "I'm going to Mod Podge that shoe box with wrapping paper." The name derives from the term "Modern Decoupage." 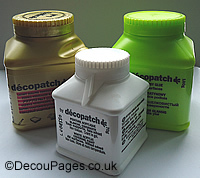 Paperpatch: The Decopatch brand glue-varnish. Water based and it's not smelly. Suitable for a wide range of surfaces. Patchliner: Like icing on a cake, patchliner gives raised areas of colour. It can also be used to stick Tresors to the finished object. Spouncer: An alternative to a paintbrush, a spouncer is a foam applicator with a handle. Squeegee: A rubber or blunt plastic edged blade with a handle used for smoothing and pressing down the decoupage/decopatch paper. Tresors: (French for Treasures) Mini jewels and other stick ons used to decorate the finished object.